Lesle sent me this photograph of a tiny building decorated for the holidays. 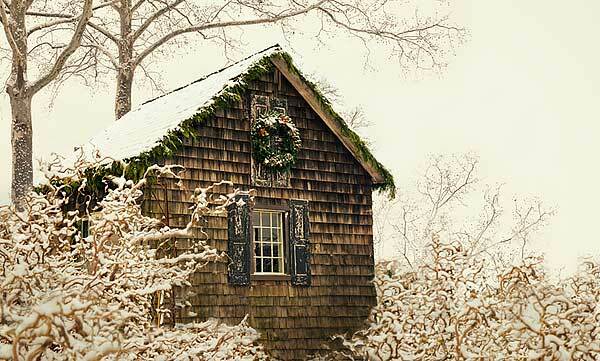 Although the landscape is rather invisible because of the white out the building is attractive and the wreath is beautiful. I like like the pine boughs used to decorate the edge of the roof. No lights here, just natural decorations. You will need to use your imagination on the landscape and put it where you would dream this little building should be located. Thanks Lesle for this holiday picture. I can almost smell the pine, feel a cold breeze on my face and think about the turkey roasting in the oven. Oh to win the lottery and build my tiny house in the country. I wish, I wish, I wish. That photo would make a lovely greeting card. Love it! I have just the spot for it too.